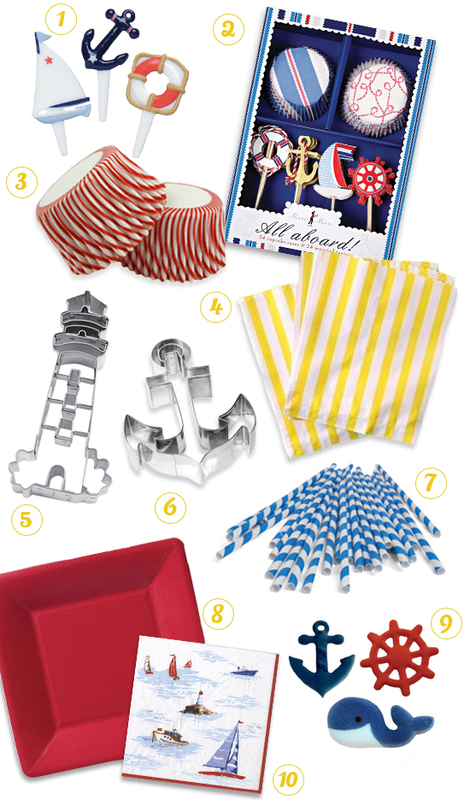 We have the perfect Nautical Cupcake How-To for your “get away” get together! 1. Make your favorite cupcake recipe. Bake and cool as directed. Frost as desired. A simple swirl will hold the wafer paper nicely! 2. Carefully cut out the wafer paper shapes using craft scissors. Be careful, wafer paper is fragile! 3. Roll out your white fondant and cut out your circle shapes using the 2″ Round Cookie Cutter. 4. After you have all your shapes prepared, adhere the wafer paper icon cut-outs using a small layer of karo syrup or clear writing gel to the top of the fondant. 3. Flip each finished piece face down on a piece of wax paper to dry for about 30 mins. 4. Once dry top your iced cupcakes with your fondant Nautical icons!